40 x 4mm Stainless Steel Woodscrew CSK Posidrive Pack of 10. 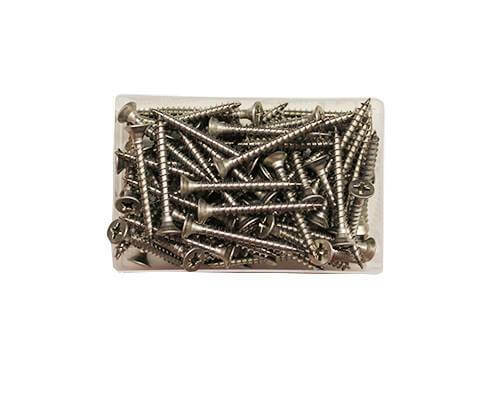 40x4mm stainless steel wood screws supplied in a tidy pack of 10 for your fencing installation to make sure you can easily access them on site. 45 x 5mm Stainless Steel Woodscrew CSK Posidrive Pack of 10. 50 x 5mm Stainless Steel Woodscrew CSK Posidrive Pack of 200. 50 x 5mm Stainless Steel Woodscrew CSK Posidrive Pack of 10. 60 x 5mm Stainless Steel Woodscrew CSK Posidrive Pack of 10. 75 x 5mm Stainless Steel Woodscrew CSK Posidrive Pack of 200. 75 x 5mm Stainless Steel Woodscrew CSK Posidrive Pack of 10. 90 x 5mm Stainless Steel Woodscrew CSK Posidrive Pack of 10. M6 Galvanised Washers Pack Of 10. M8 Galvanised Washers Pack Of 10. M10 Galvanized Washers Pack Of 10. M12 Galvanized Washers Pack Of 10.